Day by day Qmobile increasing its budget smartphones with all latest features if we compared to other companies like Nokia, Samsung, HTC, Huawei this time Qmobile introduced Noir A8i. 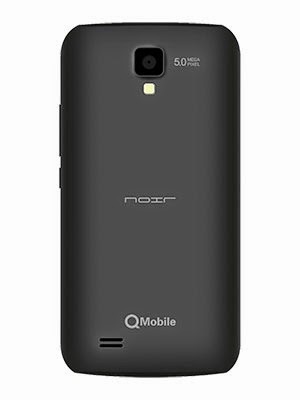 Qmobile Noir A8i is specially design for students and businessmen, Noir A8i has beautiful design and best performance like other great smartphones.It has dual sim with 3G (WCDMA (900 / 2100)) support, Fm Radio, WiFi, GPRS, EDGE. Android OS Version 4.2 (jelly Bean), 4 GB built-in ROM, 512 MB RAM, MicroSD card-support up to 32 GB, 1.3 GHz Dual-Core processor, 4.0-Inches screen size with 126 x 64 x 9.3 mm WVGA LCD Display, GPS + A-GPS supports, HTML5 Browser, FM Radio, Dual SIM, Torch. 5.0 Mega-Pixel Rear camera, LED flash, Geo-tagging, Video, On front side it has VGA camera.